Back in the day there was File Under Easy listening. They were not afraid to rock and the teenage Nathan Connolly played his guitar slung low and turned up high. Colin Murray was their cheerleader / manager and F.U.E.L. released a tune called ‘Closure’ that showed promise. Somewhere in my archive I have a photo of their singer giving me the finger from the Nerve Centre stage, supporting Snow Patrol in May 2000. Innocent times. Nathan got his call-up papers to the Patrol shortly after. But he must still have the urge to rock, hence his new project, Little Matador. 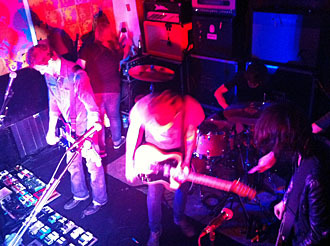 They play their first show at the Goat’s Toe in Bangor. Dave Magee, sometime F.U.E.L. stalwart and LaFaro shaker is on guitar. Likewise Troy Stewart from The Windsor Player. Gavin Fox from Turn is the bass guy, while Paul ‘Binzer’ Brennan bashes the skins. They’ve surely put in the rehearsal time and have worked plenty on the album, but that hasn’t excused Nathan from party time at Voodoo until 6am on gig day. You might say that it adds to his appeal: paint the words LOVE and HATE on his knuckles and he’s a ringer for Robert Mitchum in ‘Night Of The Hunter’, all hooded eyes and cool wastage. And as promised, the big tunes are uncoiled and the riff has dominion. Nathan on vocals, looking sure and not without some handy tunes. The LM posse have the rude intent of Queens Of The Stone Age. The songs stutter and roll. The DNA code is definitely writ with Nirvana and the incandescent howl of ‘Aneurysm’. Song names are withheld for now, but the author knows how to serve up a chorus and is savvy enough to dial in a couple of quiet songs for effect. They’re smiling plenty and throwing shapes on the little stage. A few days later and they will have the space and the audience at the Nine Inch Nails support in Belfast. Easy work, you would suppose. Little Matador: no bull.